Three Stream Recycle Bin meets NYC Business Recycling Regulations that become enforceable on 08/01/2017. Are you ready for August 1, 2017? New York City building managers and business owners you need to get receptacles on site ASAP. 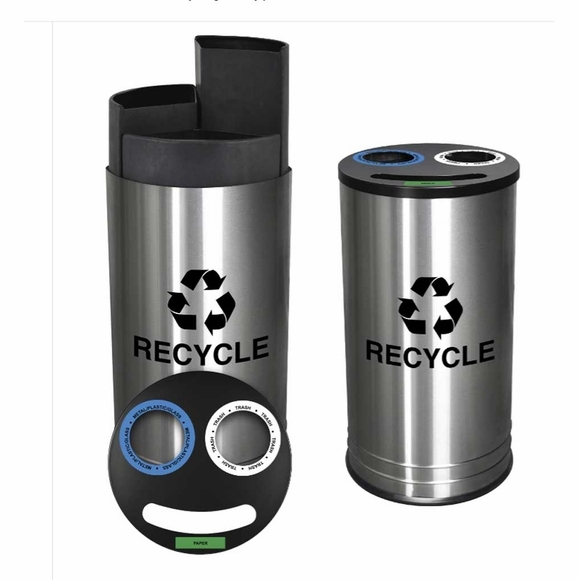 Comfort House has the quick solution for you: a stainless steel three stream recycling bin designed specifically for the New York City regulation. Even includes labeling that complies with the new rules. So save yourself the hassle and expense of fines and violation inspections. Smiley style lid has three separate openings labeled and color coded: METAL/PLASTIC/GLASS in blue; TRASH in white/black; and PAPER in green. Combined 14 gallon capacity. Top removes from body for easy empty and cleaning. Lid includes clip to maintain the correct position over individual waste liners. Liners have top lips for easy removal. Double-beaded base provides additional strength. Form-fitting, vinyl, full wrap trim protects base of unit and flooring. Dimensions: 15" diameter x 28" high; weighs 31.5 pounds. Contains more than 60 percent recycled material and 100 percent post-consumer recyclable. ADA compliant. Please contact us for quantity price quotations.